Technique: The book has been folded and shaped, mounted on a specially treated wooden base with black lacquered frame. 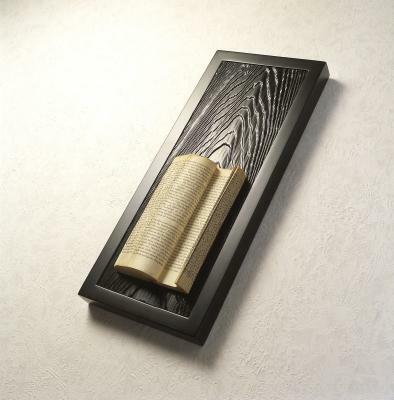 Description: In this fine piece of art the folded book corresponds beautifully with the lively grained wooden panel it is mounted upon. The book suggests as if someone just dropped his reading; the folded pages are still open and are reflecting the waves of the lacquered wood.